D11: What's Wrong with Devices Everywhere? Reports coming back from D11 indicate that most companies are focusing on (according to a report attributed to Mary Meeker) "Wearables, Drivables, Flyables, Scannables". Simply put, I tend to disagree still. While all these brilliant minds are gathering, I think the feedback leaking out feels as out of touch as the iPhone... I'm not sure it even sounds different anymore. With respect to wearables, I believe the pre-backlash against Google Glass is telling, and has more to do with the fact that people are very comfortable with their smartphones... and not so comfortable with the Borg-like assimilation of them. I think Apple will run into the same sorts of issues with the iWatch. I'd rather put an iPhone on an arm- or wrist- band than have both an iPhone and an iWatch... that makes two devices to manage the care & feeding of... this goes directly against the premise of the SmartPhone... the idea that *one* device is your buddy and your complete "away-mission" kit. The idea of drivables is similar. Computers in cars is one thing. I don't want to have another computer interface in my car. Blame it on R2-D2 and the Borg. No one wants to be assimilated. Further, why carry an X-Wing (or Y-Wing or B-Wing) fighter around when you can have your astromech (smartphone) follow you from fighter to fighter? While I fully agree... any company worth their salt should be looking at making everything have a well connected computer in it, they should not, necessarily, be looking at having a human interface on those devices. These should be control & reporting processors built into devices, not redundant smartphones built into devices. Let the interface be our beloved astromech... I mean smartphone. I love where some auto manufacturers are going with things like Ford SYNC. The ten year cycle on the smartphone is only just beginning, and wearables, drivables, flyables and scannables probably won't work as stand-alone products, but as extensions of the smartphone era. A few weeks ago I posted a bit about how Windows 8 is not killing the PC market. I'll now take that a step further and argue about the one thing in Windows 8 that is really making me regret not having new hardware... an actual compelling reason to really think about a new PC, for me. Around the time I wrote the original post, I was looking at taking advantage of Windows 8 Pro / Hyper-V on my home PC... mostly because emulators for devices such as Surface and Windows Phone 8 make use of it. I have Hyper-V on my work system, and it's fantastic for a variety of reasons. I'd all but forgotten that my home PC didn't have a processor that supported VT-x technology, meaning no Virtual Machines... so when I went to add the Hyper-V role, I was somewhat disappointed to discover it was a no-go. "Maybe it's time to upgrade something," I thought. I could get a new machine... but it's pretty hard to justify the chunk of change based on this one feature. (Never mind that it's not so easy to liberate that kind of money from the budget.) "I'll order a new processor that supports Virtual Machines." VT-x. So I dropped the $200, instead.... placed an order for a dated, but still more feature-rich chip. I waited for the thing to arrive, and finally sat down, lifted the old CPU out, and dropped in the new one. After the successful screw-top surgery, I pulled up the dialog to add Hyper-V only to discover that... the new CPU doesn't have the guts to run Hyper-V on Windows 8 either. Seriously miffed, (because I know VM technology is older than Hyper-V, and I just burned $200 for 2-3 more FPS in WoW) I started looking into what the deal was. Turns out Hyper-V on Windows 8 requires an additional virtualization technology in the processor called SLAT. None of the processors that fit my home PC support SLAT. If I want Hyper-V, (which is highly desirable for coders like myself who want to use Microsoft tools for the latest MS platforms) I *must* replace the vast majority of my PC's components... but, really... economically speaking.... I need a new PC. I can't buy a new PC for less than $2k that will outperform my current system... so, when it comes down to it, the ONLY reason I can think of to upgrade would be for Hyper-V... what a pain. 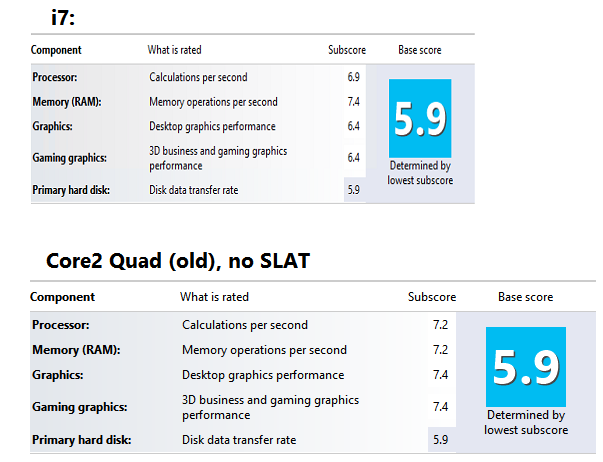 Here's a comparison between my PC (Hyper-V no-workey) and a much more modern i7 (Hyper-V workey)... note that the i7 is an Intel i7-720M, but it's processor score (6.9) in the Windows Experience Index is less than the experience index of my older Yorkfield Core 2 Quad-Q9400 (7.2). (both systems are hobbled by their disk platters).